When foreigners judge Americans in terms of cars, the first thing that pops to mind are pickup trucks. Which makes sense considering that a Ford F-Series truck has been our best selling automobile for the past 32 years (according to Wikipedia). 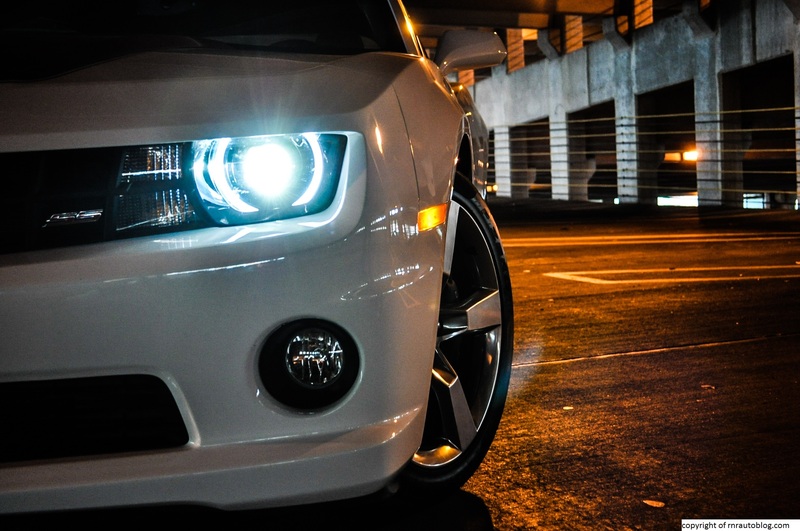 However, there is one other thing we are also known for: our muscle cars. America has a long history of shoving big horsepower engines into sporty cars, a craze that started back in the Roaring Sixties. When the economy was booming, American manufacturers wanted to add fun to their lineups. Ford was the first to jump start this idea with the 1964 Mustang. Then Chevrolet, a division of General Motors, created the Camaro three years later. So did Dodge two years later with the Challenger. The three of these muscle cars coined the term “pony muscle car.” The Camaro also spawned a twin, the Pontiac Firebird. The Chevrolet Camaro lasted for four generations until Chevrolet discontinued it in 2002. 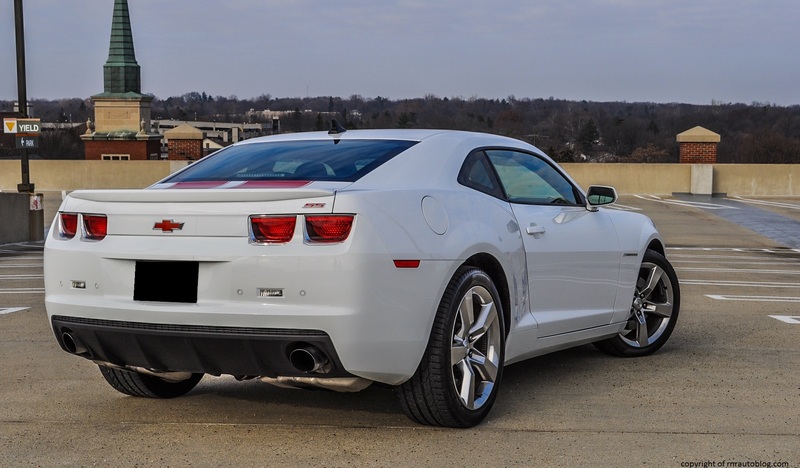 By the time the fourth generation arrived, the Camaro and its twin, the Pontiac Firebird became more like big sporty coupes rather than sports cars. Due to lackluster sales and the market’s decreasing appetite for sporty coupes, General Motors discontinued the Camaro and the Firebird. However, in 2006, Chevrolet showcased the Camaro Concept at the 2006 Detroit Auto Show to unexpected levels of acclaim and praise from spectators worldwide. The Camaro became more prominent, especially in its role as Bumblebee in the Transformers series. 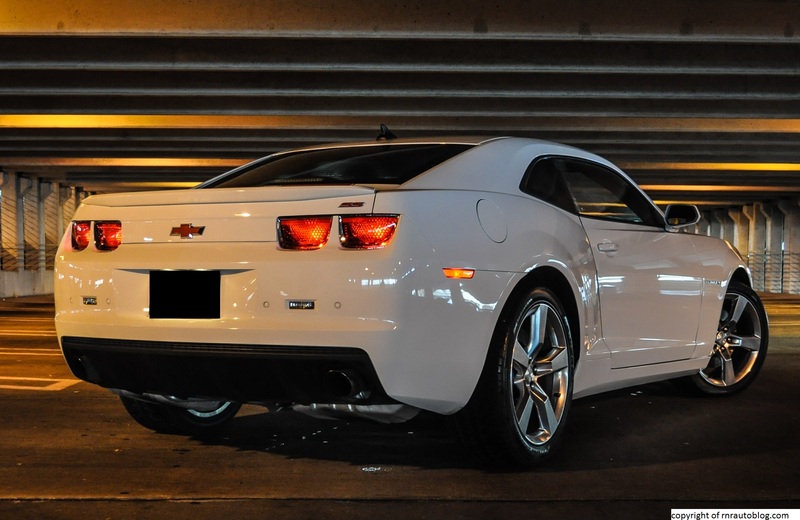 The overwhelming demand for the Camaro was too much for Chevrolet to ignore, so they made the decision to produce the Camaro as a 2009 model. 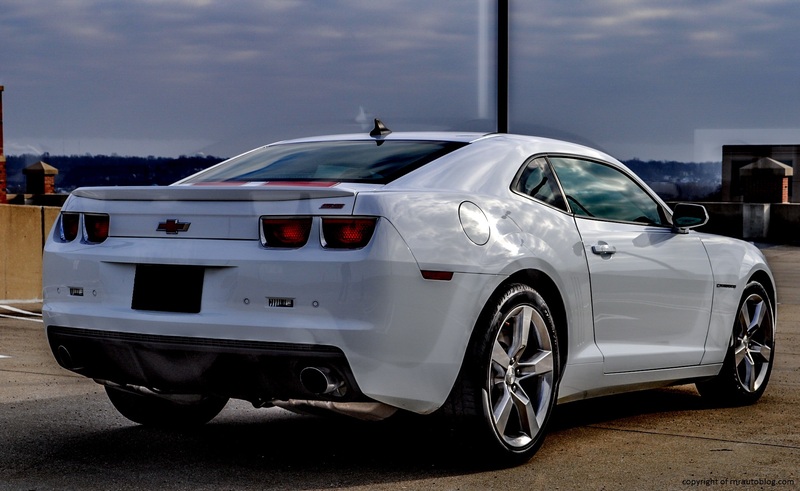 The release date got pushed to spring 2009 to produce the Camaro as a 2010 model. The Camaro was designed and engineered by GM’s Australian division, Holden, and it was built off the “Zeta” architecture that underpinned many Holden vehicles. 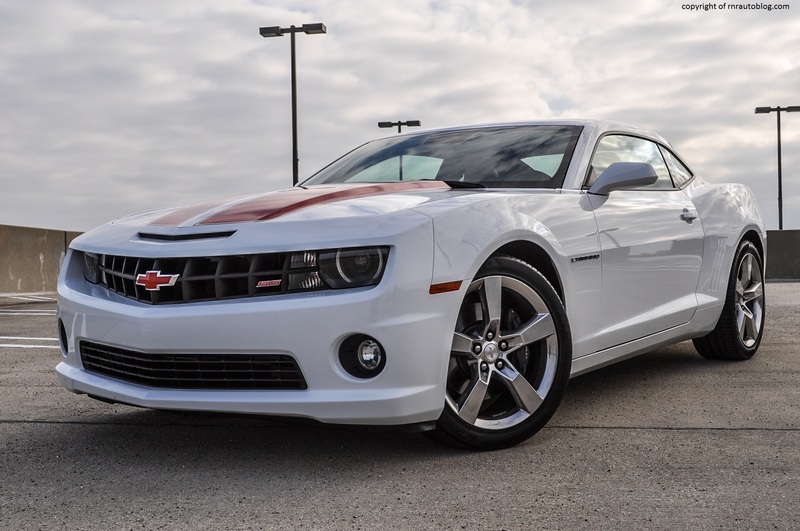 After reviewing a Mustang, and a Challenger, I was anxious to review a Camaro. However, you may remember that I will refuse to review a car unless it is in the proper specification. That’s right, I told myself I would review Camaros only with a manual transmission. Problem is that this is America. 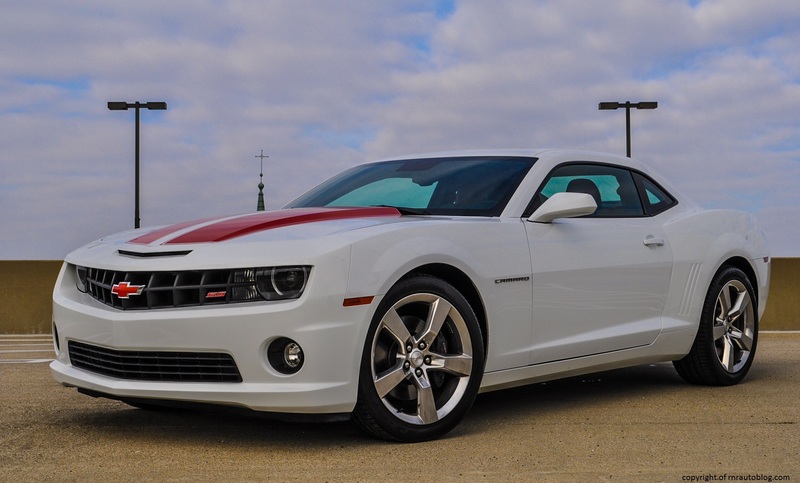 Luckily, the opportunity presented itself soon enough, and it was not just any version of the Camaro, it was the top of the line version, the SS! When the Camaro first came out, I did not like way it looked. It just looked too cartoonish. I cannot put my finger on it, but this Camaro’s design just did not work for me. However, there are very nice styling details that augment the design well. For instance, I love the grille design, and how the middle portion protrudes outward. The headlights look sharp and intense, and I like how the grille and the headlights look like a singular full width unit. The chiseled bumper and the hood bump complement its aggressive stance. The side profile is befitting of a sports car, and it is my favorite aspect of the design. The broad shoulder from the rear morphs into a distinctive character line as it reaches the door. The proportions are spot on, and the sloping roofline gives it a low slung sports car appearance. The gills before the rear well are a nice retro touch that heralds back to the first Camaros. 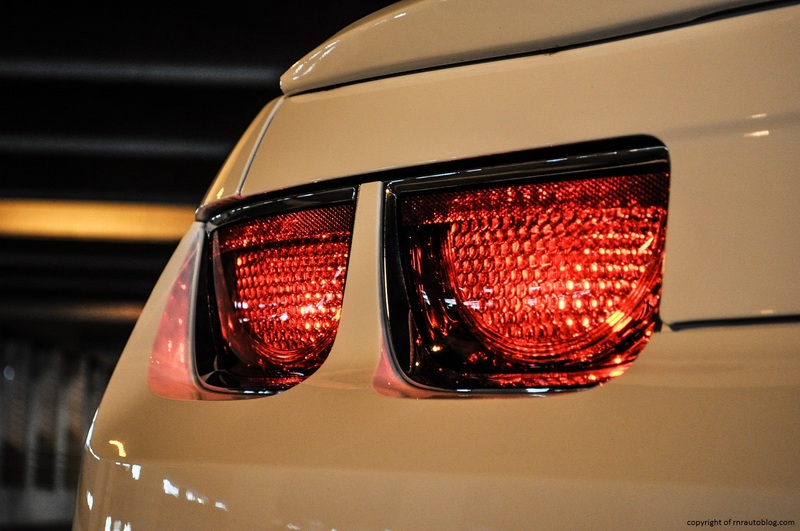 Four taillights adorn the rear as well as two large exhausts. My only criticism of the rear are the reverse lights as they are awkwardly located. Even though the exterior is traditional, the interior is futuristic. When I got in, I could not help but think that this car was made for people living 50 years from now. The massive steering wheel, the design of the gauges, and the controls give it a spaceship feel. 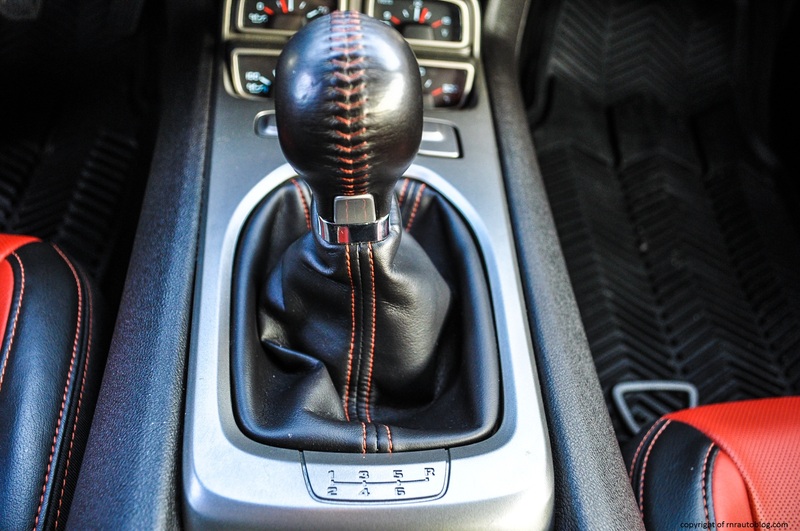 One of my favorite details is the shifter. The shifter features stitching that resembles a baseball glove, and the gauges located ahead of the shifter look cool as well. The interior looks phenomenal with a red and black color scheme, and the red stripes on the exterior look great as well. Considering that automotive publications decried the Camaro for its uninspiring handling compared to the Ford Mustang, I was shocked at how that was not the case here. This thing sticks like glue! The performance tires fitted to the SS are superb, and they never seem to run out of grip. The combination of excellent grip and lack of body lean make this a very capable machine. It was a hoot to hustle in twists and turns, and when the rear breaks loose, it regains its composure easily. 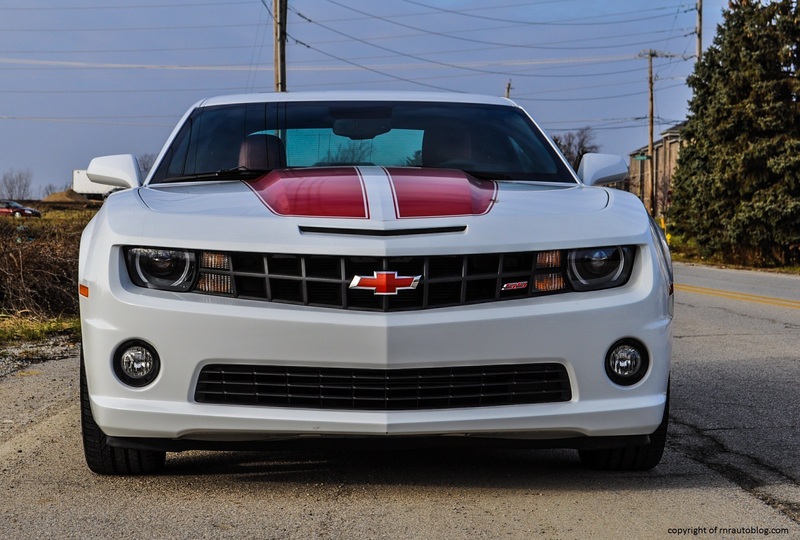 Whereas the Mustang feels light and agile, the Camaro feels heavier. But that is not necessarily a bad thing. It is heavier, weighing at close to 4000 pounds, but this translates to a reassuring feeling of vault-like solidity. The only thing that mars the driving experience is the steering. The handling characteristics have no meaning to me if the steering does not connect me to the road. Sadly, the steering is overly light and conveys no feel. It comes off feeling a bit artificial as the steering builds up weight abruptly. 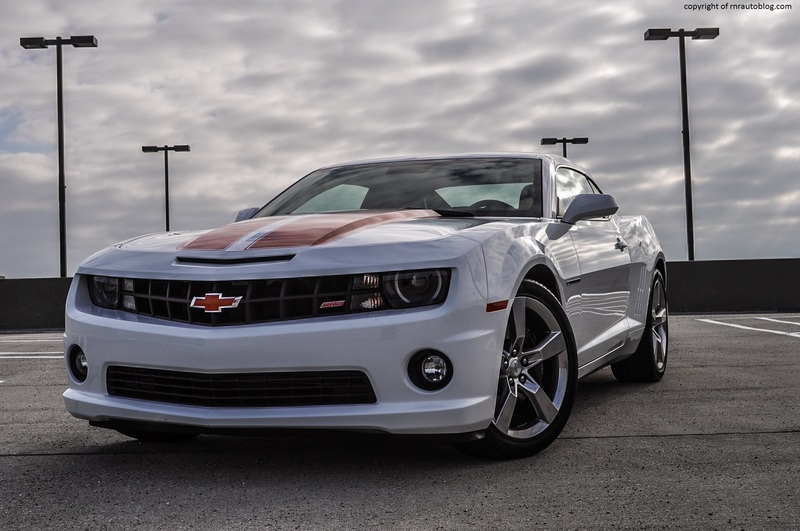 If anything, the steering makes the Camaro feel bulky because it is slightly slow and imprecise. 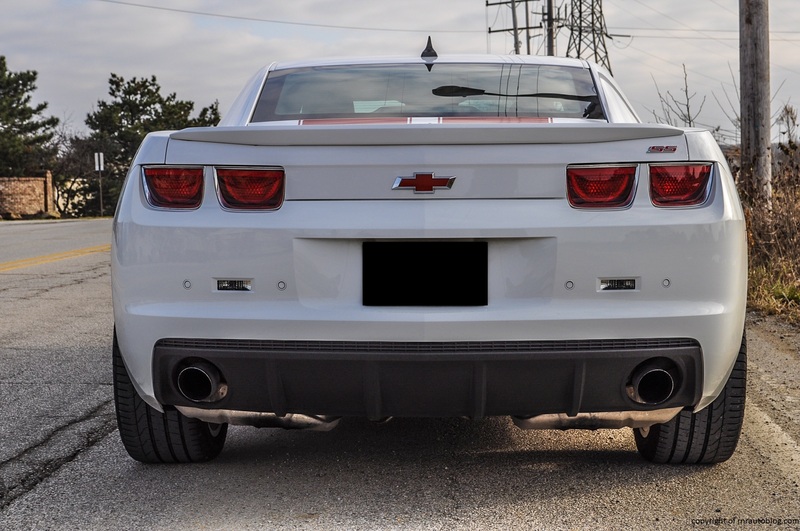 Even though the Camaro is an adept handler, the connection between the driver and the car is not there. Like I said, this car feels well built and devoid of rattles and squeaks, and because of this, the ride quality is commendable. No matter how deteriorated the roads are, the Camaro quells them well. 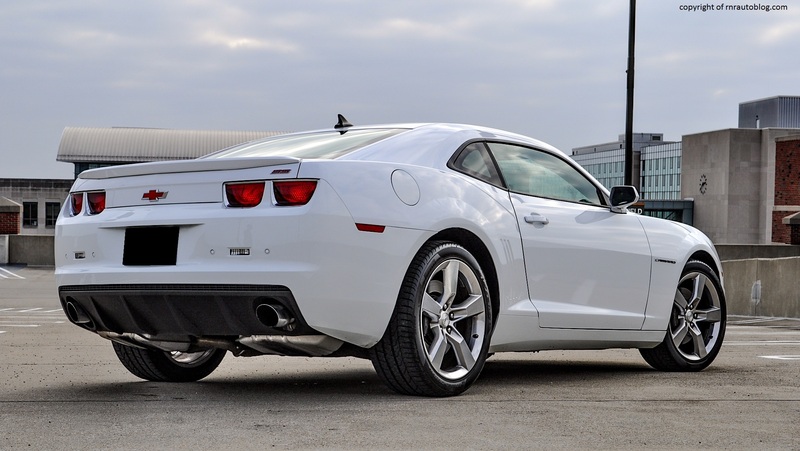 The brakes fitted to the Camaro are excellent with a responsive brake pedal and terrific stopping distances. No doubt about it, my favorite part of this car has got to be the engine. 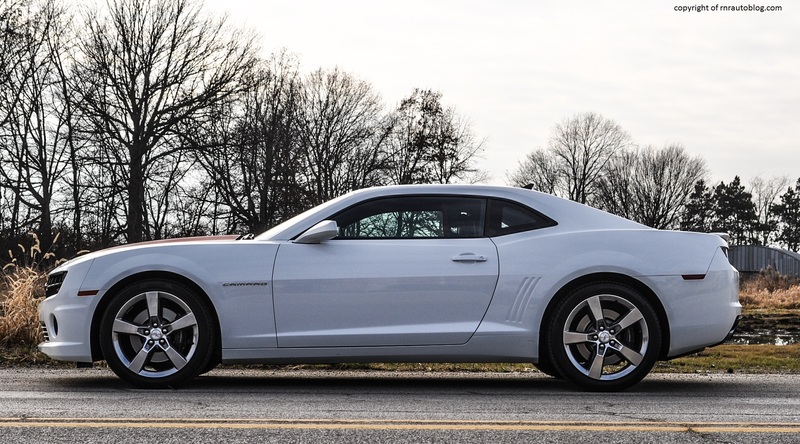 Whereas the lesser LS and LT came with a 312 horsepower 3.6 liter V6 (a new 323 horsepower 3.6 liter V6 came in 2012), the SS models came with a V8. I am going to take this moment to announce why you should get the SS as a manual. 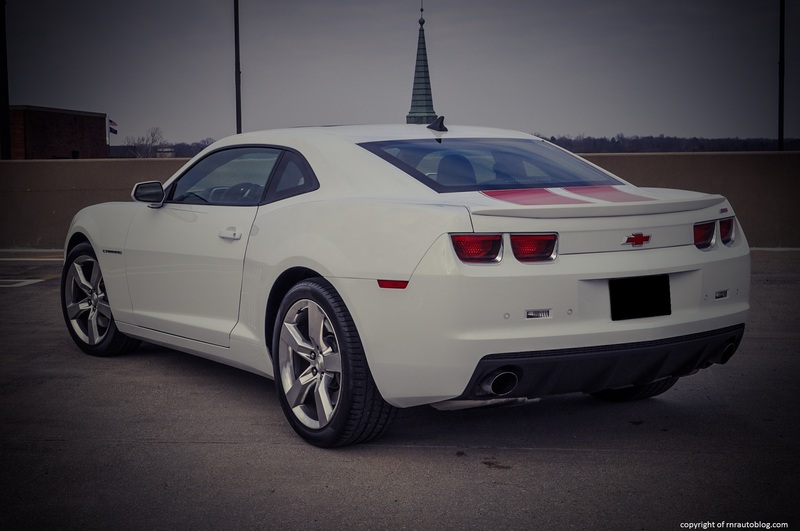 In manual transmission models, the SS gets the “LS3” 426 horsepower 6.2 liter V8 straight from the C6 Corvette (2008-2013). However, in automatic transmission models, the SS gets a revised version of the same engine dubbed the “L99” but with a decreased horsepower rating of 400. The automatic versions get a fuel management system which allows the engine to run on fewer cylinders than needed to save gas which the manuals lack. The V8 is a wonderful thing. It spreads torque so evenly and it builds up in a linear fashion. What I mean is that there is no lapse in power, and its power delivery is silky smooth. Acceleration is explosive to say the least. Even in high gears, the bountiful torque gives it a hefty shove. Floor it up to the redline, and it just catapults. Even when cruising on the highway, I don’t have to downshift to overtake or for a sudden burst of speed. The well spaced ratios and the torquey V8 make cruising a breeze. The transmission is what some people would call a fly in the ointment. Considering how seamless and relaxed the V8 is, you would expect the shifter to be as well. Unfortunately, the shifter is clunky. It slides into gear, but it does not feel smooth when you do it. The clutch is super touchy, and it is very difficult to execute shifts smoothly. The clutch has excellent feedback though, and I liked the heavy weight. 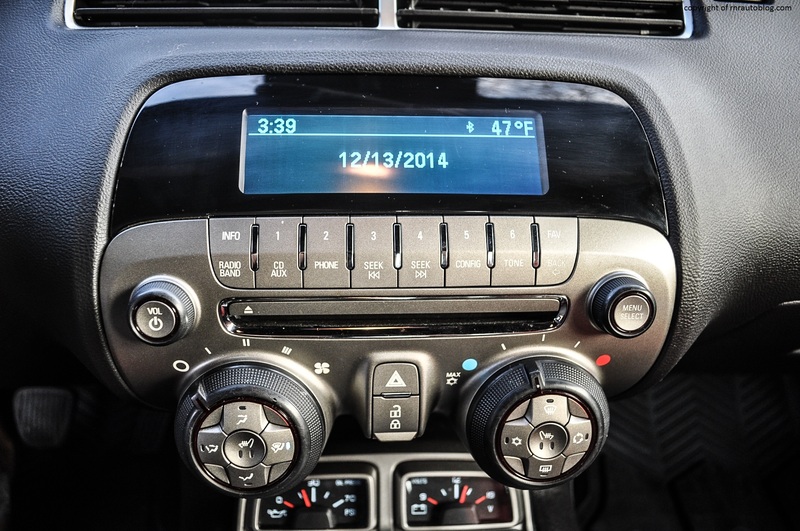 Fuel economy is middling as its official combined mpg is 19 mpg with the manual transmission. I do not know if it is the tires themselves or the car itself, but this car is noisy. 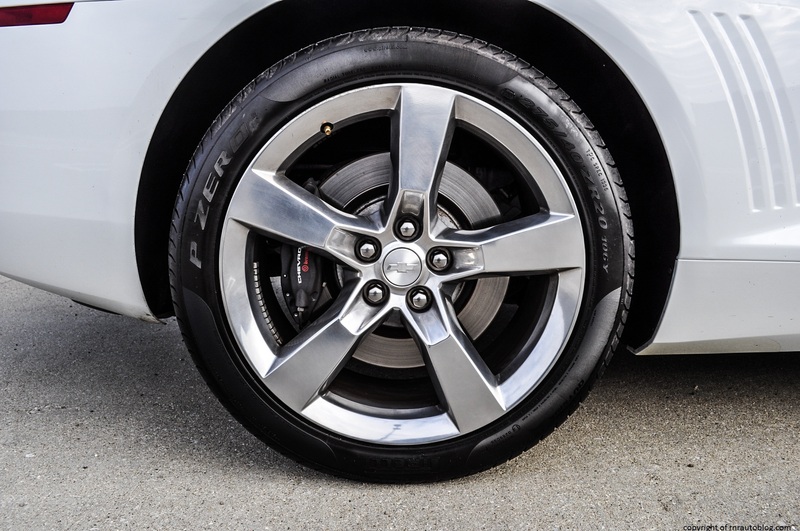 The tires may be great for handling, but their sizes mean that you are always aware of them. However, This only occurs on highways or at speeds higher than 60 mph. At those speeds, you can hear them literally slapping the pavement, and there is considerable wind noise as well. The V8 is pure American. At low revs, it stays muted but stomp the accelerator, and you could be forgiven for thinking you woke the beast up. It simply growls like no other. When you sit in the driver’s seat, the first thing you notice is how comfortable the seats are. They hug you, and the cushioning and bolstering is spot on. 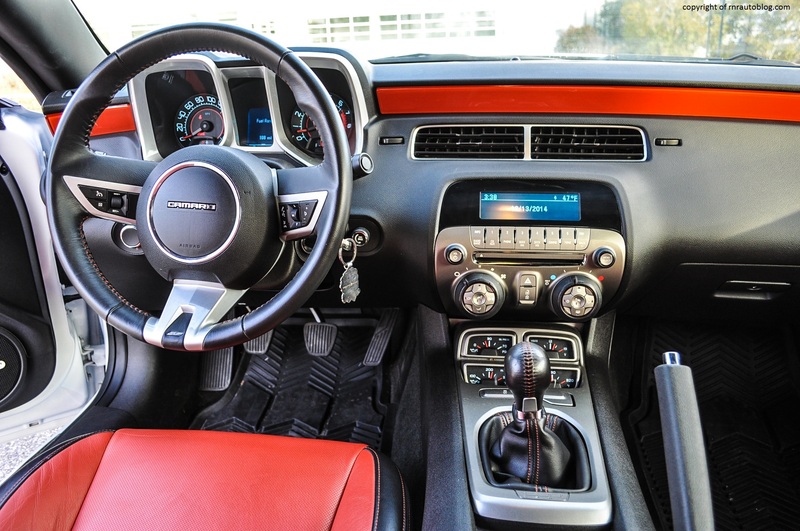 To make the Camaro look as great as it does, there were some compromises which are evident in the cabin. The short windshield affords a limited view of your surroundings, and visibility is severely lacking. You cannot, and I am not kidding, look out the back when changing lanes. When I was learning to drive, my dad taught me to always look behind in addition to using the mirrors because sometimes there are blind spots that mirrors do not catch. In this car, you have to rely on your mirrors entirely which is a bit disconcerting. The low roofline also means that headroom is restricted, and this made finding a comfortable driving positions harder than it needed to be. The dash is relatively high, so whenever I raised my seat in order to be able to see over the wheel, my head brushed against the roof, so I ended up seating lower than I would like. 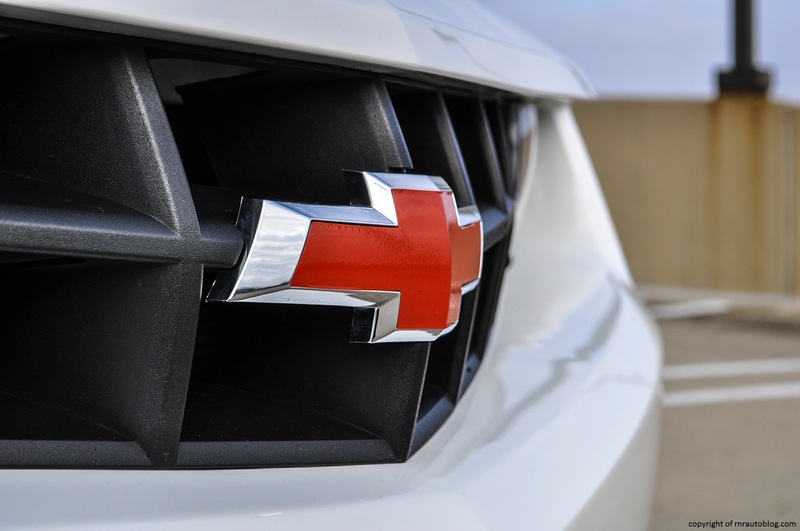 However, I did additional research, and I learned that the sunroof option reduces the headroom available significantly as opposed to models equipped without sunroofs, so when buying a Camaro, I advise you to compare models equipped with the sunroof and equipped without it. The cabin is well finished except for a few details. The hard and scratchy dash is the only flaw in what is an otherwise nicely built cabin. 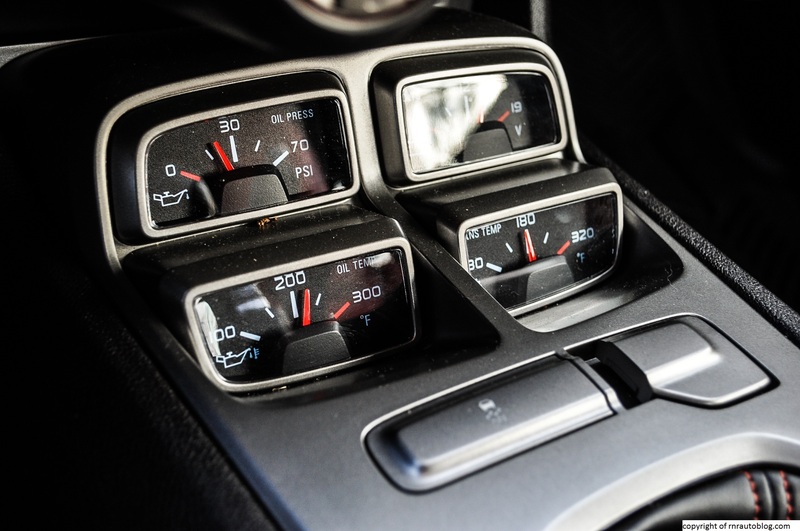 The controls are straightforward, and there are gauges beneath that depict the engine temperature, oil level, oil pressure, and transmission temperature. While it is meant to be a throwback feature to classic Camaros, it is useless and forces you to look down when driving. In the front, legroom is plentiful with enough space for you to stretch your legs. However, the same cannot be said for the rear as there is virtually no headroom, and legroom is minuscule. My advice is to put only people you do not like in the rear seat. The trunk is small but it is a useable size although the taillights cut into the opening. Cabin storage is adequate, but access is difficult due to the low roof and high step in. 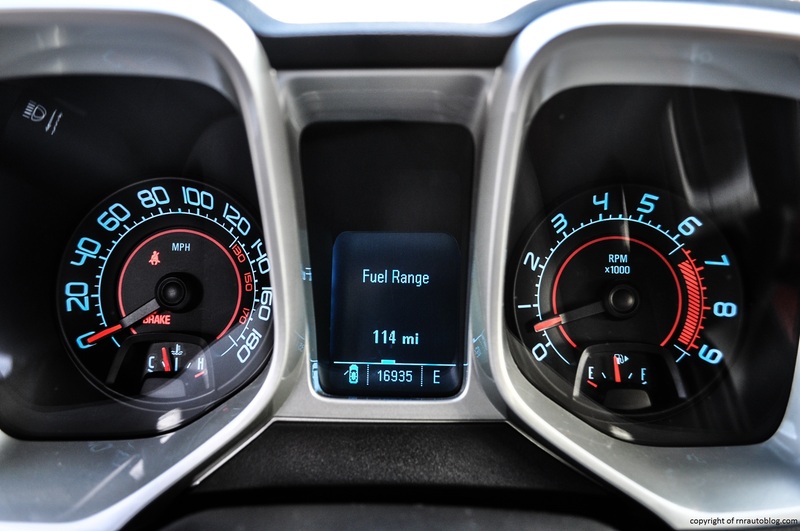 The gauges are a bit too cluttered as it can be hard to determine your speed at a glance. 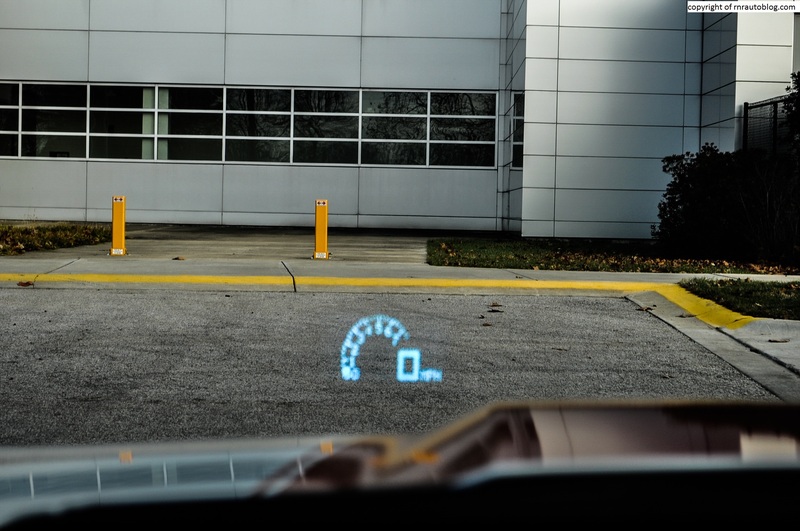 In addition to the V8, the Camaro gets a head up display from the Corvette. It relays instrument panel information on your speed. It lists your speed, a tachometer, and other useful things. To tell you the truth, I was pleasantly surprised with the Camaro. I thought that because I am a Mustang man, I would immediately dislike the Camaro. I am smitten with the engine, and the car itself is a capable performer. 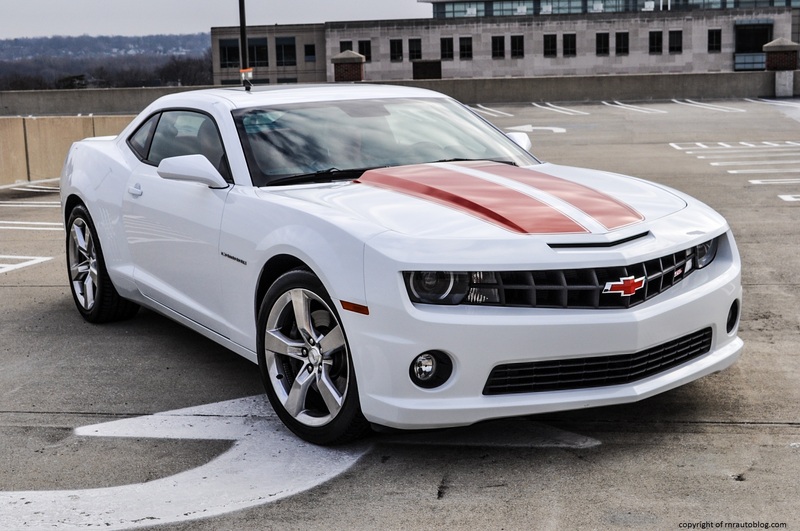 I was faced with a dilemma, do I like the Camaro more than the Ford Mustang? I texted my best friend who drives a 2011 Mustang, and I told him how much I liked the Camaro, and he was like, “Which do you like better? The Mustang or the Camaro?” Even though I was adamant that I am a Mustang guy, this Camaro left me puzzled. I told him, “But the V8 engine!” But then I remembered that I had driven a Mustang GT 5.0 which is just as fast, and I also remembered that I had more fun in that car than this. Suffice to say, I am still a Mustang guy. However, I was very impressed with the Camaro, and I think Chevrolet should be proud of themselves. 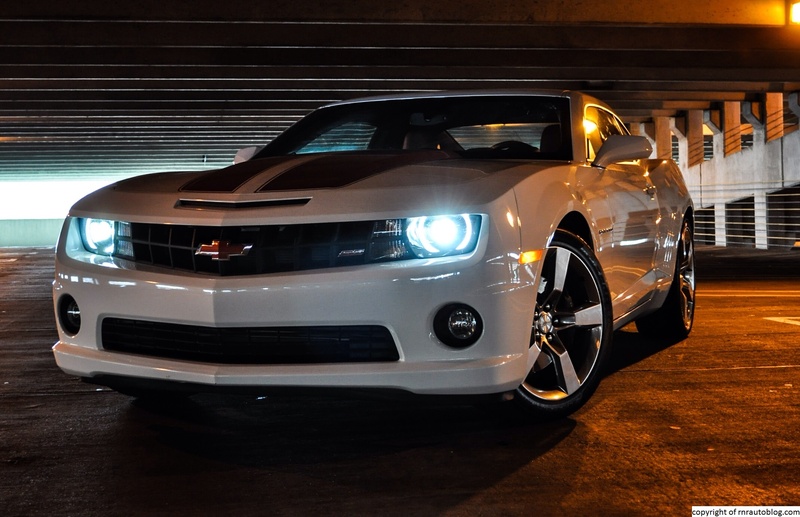 The Camaro SS looks great, it corners beautifully, and the V8 is a peach. 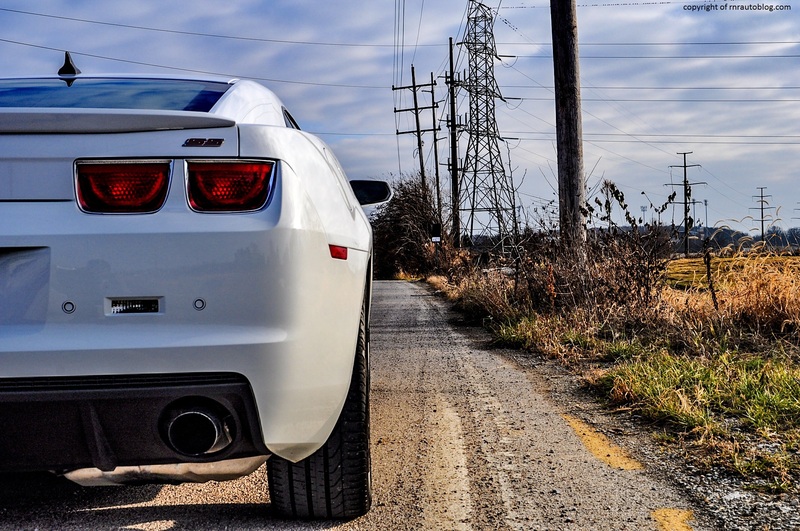 However, the Mustang is a bit easier to live with, and it provides that connection between the driver and the machine that the Camaro lacks. I would drive a Camaro but on one condition. It has to look like Bumblebee from Transformers so I can tell people I drive an Autobot.